Young Hero Bellamkonda Sai Sreenivas New Film Saakshyam Helmed By Dynamic Director Sriwass Finished A Crucial 15 Days Adventurous Thematic Action Schedule In Hospet In Mining Backdrop. This Unusually Exciting Feat Composed By Top Stunt Master Peter Hein And He Calls This As One Of The Challenging Episodes In His Career. “we Finished An Overwhelmingly Impressive Schedule Of 15 Days In The Mining Backdrop Of Hospet In Karnataka. 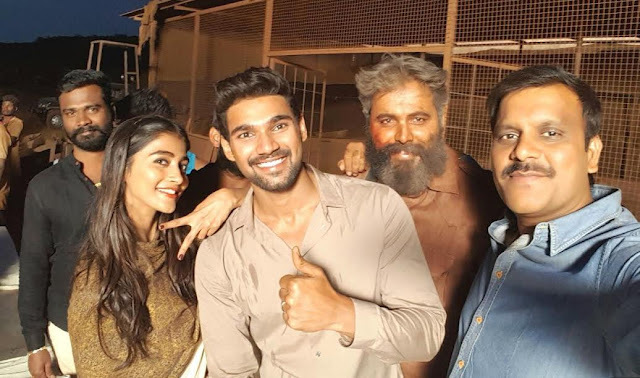 A Crucial Adventurous Concept Fight Designed By Peter Hein Is Shot On Bellamkonda Sai Sreenivas, Pooja Hegde And 200 Other Artists. One More Important Part Of The Film Is Also Completed In This Schedule Which Lasted For 15 Days. With This, 70% Of Saakshyam Production Is Done And We Will Move Forward For Remaining Part Very Soon. Our Director Sriwass Handled The Scenes Superbly And This Episode Will Remain One Of The Best In Film. Hero Bellamkonda Sai Took A Big Risk By Participating Himself Without Using Any Dupes In This Portion,” Said Producer Abhishek Nama.